Despite Hit-Girl's best-laid plans, her hitman hostage decides to stray mucking up her plans to take out his cartel buddies. With a vengeful mother with an itchy trigger finger waiting for her chance can Hit-Girl deliver for her when things go haywire? Mano was pretty upset at the prospect of having to kill his cartel buddies but it was what Hit-Girl commanded at the end of the last issue. He's still not thrilled about it as issue three opens up but she ensures him these guys are only affiliates of the cartel. Even with the lady who hired Mindy and brought her to Colombia listening from a remote area and Mindy in a nearby van watching his every move, Mano decides to improvise jeopardizing the mission. All hell breaks loose putting Mindy in the cartel's crosshairs. Mark Millar always has Hit-Girl in control even when she's out of control, everything happens on her terms. The twist here is Mano shows some ingenuity with some quick-thinking. For a cold-blooded enforcer for the cartel, he sure harbors some real affection and admiration for his colleagues. His sentiments about even these affiliates sound like they're family nevermind that they help dispose of bodies for the cartel. This harkens back to Mano saying in a previous issue that life in his part of Colombia leaves few options to prosper unless you work for the cartel. It doesn't humanize him completely but does help explain his real emotional tie to El Padre and the cartel. It's his family in a twisted sense and now with his little brother in line to follow him his resistance to Mindy's orders make total sense. With all that said, there's still a ton of signature violence as things begin to unravel. Mindy is in more legitimate danger than usual and it takes some savvy countermeasures to escape certain death. Ricardo Lopez Ortiz does some wild exaggerated character designs that feel right at home with the heightened violence. Along with Sunny Gho's muted colors that flourish in a literal blaze of glory and letterer Melina Mikulic working overtime on lettering basic dialogue, yelling, and every ping, tak, and blam of gunfire. When it comes to action the Millar-way, it takes a village of talented artists. 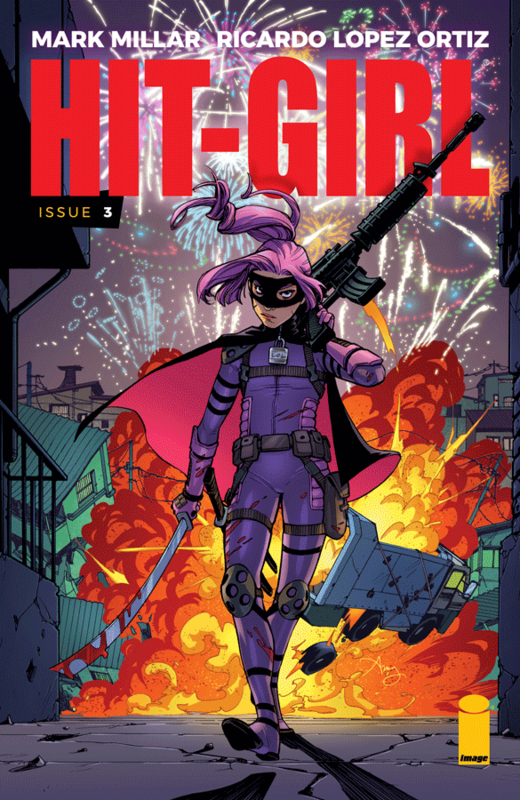 'Hit-Girl' puts Mindy through her paces in this chapter almost destroying her master plan to take out the cartel and get justice for her client. Mano reveals new layers to his character and an intelligence to match his savagery. Hard to believe this is the penultimate issue leading to one more explosive episode. It feels like Millar and company have just gotten started with another blockbuster series. 'Hit-Girl' delivers the goods month after month. Catch up now!